With the iPad, Apple claims you can “see and touch your e-mail like never before.” While that may be technically true—there’s never been a 9.7-inch tablet running Apple’s Mail e-mail client—if you’ve ever used Mail on an iPhone or iPod touch, the experience will be quite familiar. 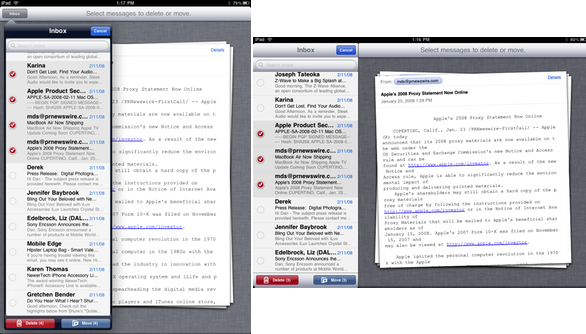 I previously took a closer look at the iPad’s Safari compared to Safari on the iPhone and Mac. 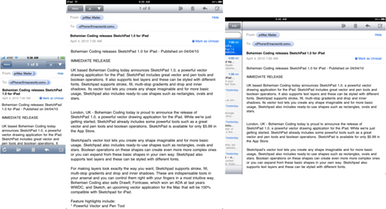 It’s time to take that same look at the iPad’s version of Mail. For the most part, Mail on the iPad is similar to Mail on the iPhone or iPod touch: You get the same overall look, the same capabilities (including the useful Data Detectors functionality), and the same buttons (although those buttons are at the top of the screen on the iPad; they’re on the bottom on the iPhone). The biggest changes you’ll find relate to the iPad’s larger screen: Apple has taken advantage of this additional area to make Mail, already one of the better mobile e-mail clients, even more usable. 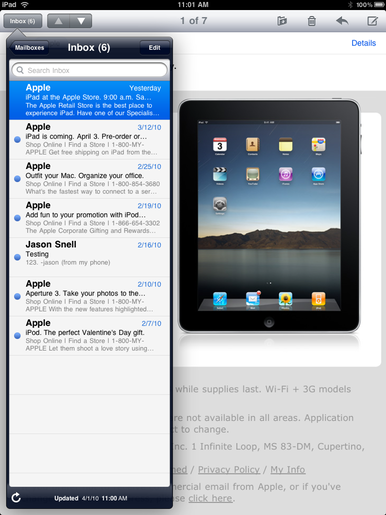 For example, as you can see in the image above, the iPad’s 9.7-inch screen lets you see more of every message. Viewing the same sample message, using the same settings, the iPhone’s version of Mail was able to display 10 lines, with approximately 36 characters per line, of the message body; Mail on the iPad displayed 34 lines, each with approximately 80 characters, in portrait mode (nearly eight times as much text) and 25 80-character lines in portrait mode (roughly 5.5 times as much). This additional real estate is especially useful when viewing attachments: on the iPad, you don’t need to zoom to be able to read the text in a PDF or Word document, or the numbers on a spreadsheet, which means much less frustrating zooming and panning. And, of course, composing e-mail messages using the iPad’s nearly full-size keyboard is much easier than using the iPhone’s tiny-by-comparison version. The other advantage to the iPad’s larger screen is that you can access Mail’s features and interface without as much of the forward- and back-tapping required on the iPhone. For example, on the iPad, Mail’s Accounts/Mailbox view is either (in portrait mode) a pop-over menu that leaves the current message mostly visible or (in landscape mode) an always-visible pane on the left side of the screen; in either orientation, the current message remains visible until you specifically select a new message. Because of this, accessing accounts and mailboxes is much less disruptive than it is on the iPhone, where you must exit the message view to browse your mailboxes or accounts. On the other hand, the Accounts/Mailbox view is still a single column, which means that to view a message in an account, you must tap the account name, then tap a mailbox, then tap the message you wish to view; to view a message in a different mailbox, you must tap the “back” arrow—once to see other mailboxes in the same account, twice if you want to switch to a different account—and then drill down again. Filing and moving messages is also still a multi-tap affair. Still, being able to keep a mailbox’s list of messages (with previews) visible is a big, big improvement over the iPhone’s one-thing-at-a-time view, and brings Mobile Mail a tiny step closer to its desktop sibling. There’s also a new visual when selecting multiple messages for moving or deleting. As on the iPhone, tapping the Edit button in any message view lets you select multiple messages and then tap the Move button to move those messages to a different folder (mailbox) or tap the Delete button to delete those messages. However, on the iPhone’s smaller screen, the only peek you get at each message is its inline (0- to 5-line) preview. On the iPad, Mail actually displays each message at full size as you check it: In landscape mode, you see the entire message to the right; in portrait mode, the message-list popover obscures part of the message, but you can still see enough to decide if it’s a message you really want to move or delete. Finally, another improvement that quickly becomes obvious is that, thanks to the iPad’s better performance, Mail on the iPad feels noticeably faster at everything. Messages—especially complex ones—display more quickly, scrolling is smoother, and attachments download and display faster. The result is a less frustrating experience for those of us who plow through lots of e-mail on our portables. Despite these improvements, Mail on the iPad is still essentially the same program as you get on the iPhone, with many of the same limitations—most of which have been present in Mobile Mail since our wish lists for the original iPhone back in 2007. In other words, don’t expect to see all the functionality you’d get with Mac OS X Mail or most other desktop e-mail clients. A unified Inbox: As Jason Snell noted in the iPad review, there’s still no way to view all the incoming messages across your various accounts in a single Inbox (although Steve Jobs has reportedly assured a customer that this feature is coming). A “Mark All As Read” command: You can’t quickly mark all the messages in an Inbox as read, which you need to do if you want to be able to use the unread-message badge on the Mail icon to track new messages. Ability to send to groups: You can’t send an e-mail message to everyone in a group, as you can in Mac Mail. On-device mailbox editing: You can’t create folders, or modify existing folders, on the iPad; you’re stuck with whatever you’ve previously set up in your desktop e-mail client or Webmail interface. Flagged status: You can’t flag a message for later action. Local spam filtering: You must rely on server-side spam filtering. Multiple signatures: You can’t configure, and choose from among, multiple signatures. Even a simple option to set a different signature for each account would be welcome. Attachment saving: While you can save images in e-mail messages to your photo library, there’s no way to save other kinds of attachments such as PDF files, Word or Pages documents, or movies. More text options: We’d love to see options for choosing different fonts, for forcing messages to display in plain text, and for choosing top or bottom quoting. While this seems like a long list—and we’d love to see these features, most of which are common e-mail client options, make their way to Mail on the iPad (and iPhone)—it doesn’t take away from the fact that iPhone OS Mail remains a solid mobile e-mail program. While it has its limitations, especially for power users, it gets most of the basics right, and it excels at the most important tasks: viewing and composing messages, displaying attachments, and connecting reliably to nearly any e-mail server. And while the iPad version is, by my ballpark estimate, 85 percent identical to its iPhone counterpart, that 15-percent difference—which is mainly a product of the iPad’s increased screen space—makes for major increases in usability and productivity.